• This is a complete and comprehensive CompTIA A+ 220-901 course. 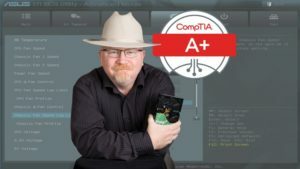 It is designed to prepare the student to be able to take and pass the first of two A+ exams needed to become CompTIA A+ Certified. To become A+ Certified requires you to pass BOTH the 220-901 and 220-902 exams. There is a separate course covering the 220-902 exam. • Once you complete the two CompTIA A+ courses, you will have the knowledge and confidence to pass the exams AND the skills to be a great PC tech. This course is ideal as both a study tool and an on-the-job reference. Work with CPU, RAM,BIOS, motherboards, power supplies, and other PC components. Work with smart phones, tablets, and other mobile devices. English, Spanish and Portuguese closed captions available. • This course is intended for anyone that is preparing for an entry level PC technician position or looking to improve their skills and become CompTIA A+ Certified. However, it goes beyond that and will give you the skills you need to be a better tech on the job.